← “The Experience Married Life Has Given Them.” Really? As you are to imitate Mrs Stanton here I thought I would tell you how I was dressed last night that you may come as near as possible. Before she left this coal mining town of northeastern Pennsylvania for the next lecture on her own schedule, Elizabeth Cady Stanton, that writer, advised Helen Potter, the woman who would pretend to be her later that week. Helen Potter (1837-1922) on stage in character as John B. Gough, temperance lecturer, when in her forties. That residents of Hazleton could hear the real thing one night and the impersonator a day or two later seems extraordinary. But it makes some sense, too: earlier in 1877, Helen Potter and another object of her talents, Susan B. Anthony, toured Illinois at the same time. After all, an impersonator’s artistry can only be appreciated if her audience is familiar with the real thing; it was in Helen Potter’s interest to know where the originals of her act were already known. 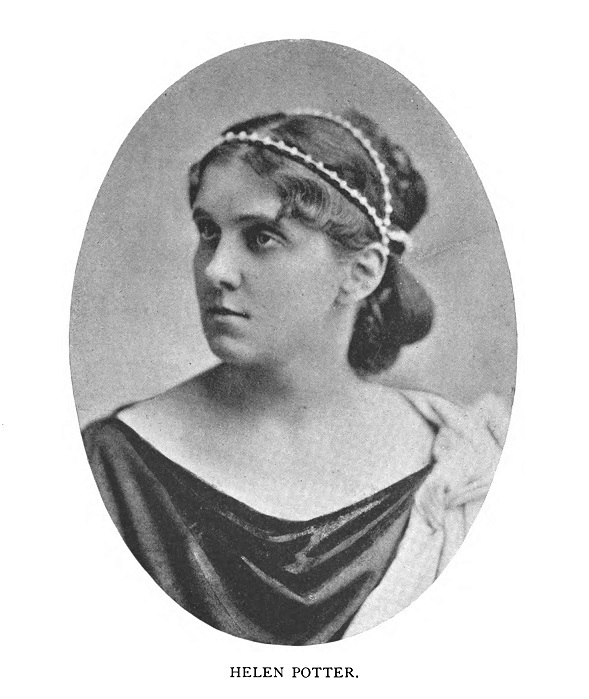 about her performances came to light with the advent of digital newspapers in which it is possible to search by word and name across many locations; queries about her uncover scattered advertisements and theatrical reviews from New York to St. Louis, though no one has yet reconstructed her travels. Another perspective is added through evidence, like the letter above, that Potter knew Elizabeth Cady Stanton, Susan B. Anthony, and no doubt others of her originals. In her book, Helen Potter teaches how to observe an actress or lecturer and make useful notes about the performance. Instructions for her imitators, for anyone wanting to impersonate, say, John Gough as she did, include the kind of stage directions that result from observation of Gough at work. Enter with an overcoat on your arm, place it over a chair, sit down and look about. Then rise, take a sip of water, wipe your mouth with a white handkerchief, replace it in the coat pocket (rear), straighten up, and begin your lecture. With additional perspectives, the transaction between impersonator and her object becomes more complicated. 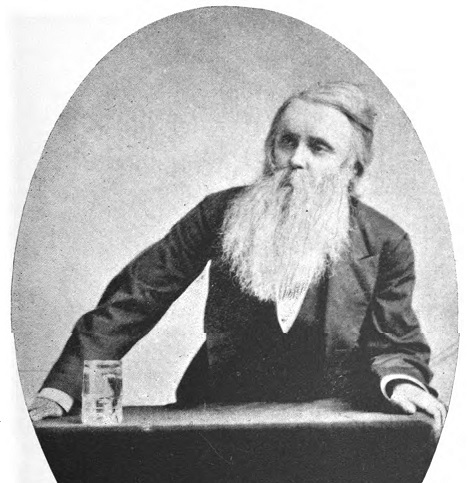 For example, the New York Times noticed John B. Gough in the audience on November 12, 1877, while Potter impersonated him; once the observed performer, Gough was seen observing the observer’s performance. Another paper reported that Gough “has given her useful suggestions” about delivering his speeches. In practice, Potter’s art had curious elements of collaboration. 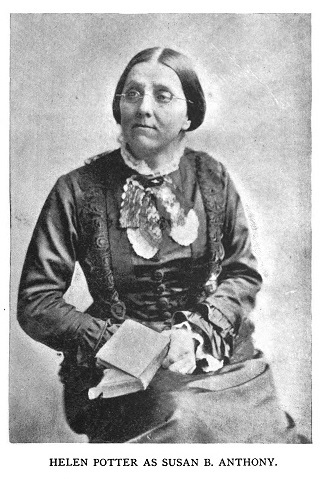 Susan B. Anthony’s diary reveals that on August 31, 1876, Helen Potter called on her at the home of Elizabeth Stanton in New Jersey. Associate Justice Ward Hunt of the U.S. Supreme Court had presided over Anthony’s federal criminal trial in 1873 and famously if misguidedly asked the routine question, “has the prisoner anything to say why sentence shall not be pronounced?” She answered with a forceful statement of equal rights. Anthony sometimes repeated it at the close of her own lectures, and now Potter would amplify her words. Although the diary entry is silent about Potter’s plans for Stanton, it is likely the women settled that too. Potter selected the Declaration of Rights of Women of the United States, written that summer for the Centennial of 1876 and presented in Philadelphia on the Fourth of July. It was an odd choice: it was not one of Stanton’s lectures and lacked the cadence of oral performance. Stanton was not even the Declaration’s sole author. But it did condense the rights of women into a powerful message. A rich, dark robe, plainly made, open at the throat, revealing a soft white kerchief or lace crossed underneath, and a tabbed head-piece of black thread-lace, complete the toilet. a piece of soft blond lace round the neck & running to the waist with a large cameo pin, the lace puffed a little round the pin. Potter’s real strength lay in elocution, habits of speech, and voice control. To preserve her art and allow imitators to learn her craft, Potter created a system of notation to record the sounds, pitch, and timing of her subject’s public speech. She later described it as a quest “to perpetuate, by diacritical marks and descriptions, what is now (in 1914) so marvelously and perfectly done by the phonograph.” In this opening paragraph of Anthony’s reply to the judge, some of Potter’s codes are put to use. 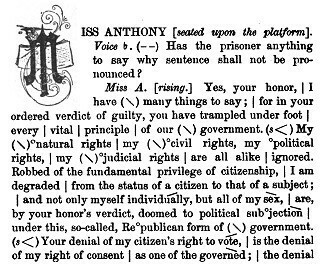 Helen Potter’s codes remind her and instruct students how to sound like Susan B. Anthony speaking in federal court in 1873, from Helen Potter’s Impersonations, p. 12. The judge’s voice is marked as a nasal monotone. The backward slashes that pepper the paragraph indicate “downward pitch, to the next bar or change,” and they capture a distinctive pattern in Anthony’s voice that is not so abundant in Potter’s marks for other speakers. The symbol (s<) indicates her voice should increase in force through the entire sentence that starts “My natural rights” or “Your denial.” The degree signs indicate that a word or syllable is uttered at a high pitch, so in the words “Re°publican form of government” the pitch rises on the second syllable. And so on. Potter’s impersonation of Susan Anthony appears to have been second only to her John Gough character in popularity. In Philadelphia in April 1877, a theater critic was not at all impressed by Potter’s program until she performed Anthony. Then followed the crowning triumph of the evening’s entertainment. We imagined it was the redoubtable Susan herself that was before us. For this personation she received a deserved call before the curtain. At New York City’s Chickering Hall, in November 1877, Potter performed Anthony so well that a critic for the New York Times celebrated ideas that his newspaper disliked when the real Anthony spoke them. Then Susan B. Anthony stood up for the rights of female citizens, proclaimed her title to the franchise, resented the tyranny of her lord and master, man, and proclaimed her unalterable determination of combatting it forevermore. The vraisemblance was undeniable, and the applause was hearty. said it was for S B A. personally–no society no committee–no cause but S. B. A. A Miss Helen Potter then read a most brilliant paper, which had been written by Mrs. Stanton, and contained all the statements that Mrs. Stanton would like to have said, but her health forbade the exertion. # Helen Potter, Helen Potter’s Impersonations (New York: Edgar S. Werner, 1891). # Albert Milton Tennant, Genealogy of the Tennant Family, Their Ancestors and Descendants Through Many Generations (Dunkirk, N.Y.: Dunkirk Printing Co., 1915), 145, 229-231. # James B. Pond, Eccentricities of Genius: Memories of Famous Men and Women of the Platform and Stage (New York: G. W. Dillingham Co., 1900), 170-171. 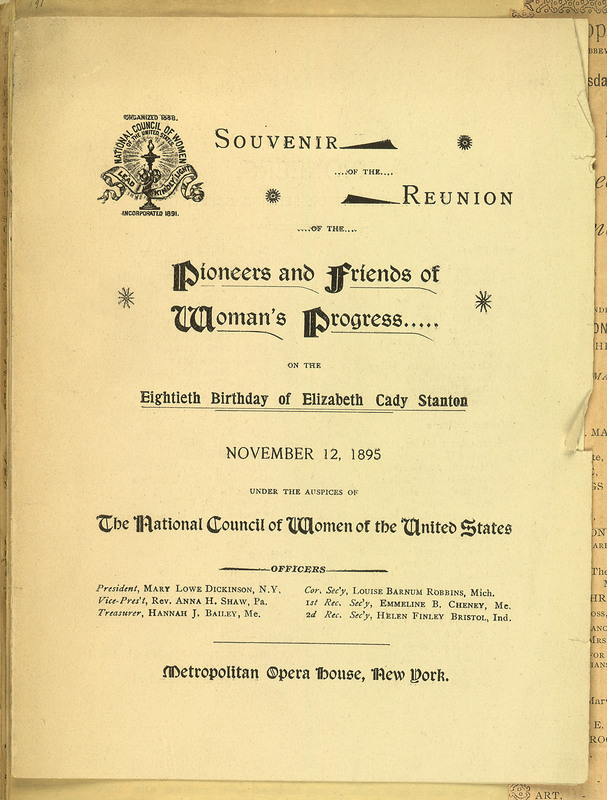 This entry was posted in Details and tagged Elizabeth Cady Stanton, Helen Potter, impersonation, John B. Gough, lyceum work, Susan B. Anthony, woman suffrage, women’s rights. Bookmark the permalink.